Civil Department through MPSC Engineering Services Preliminary, Mains Examination 2019. The candidates who are looking for a government job they may apply online on or before 26-04-2019. Written examination will be conducted under Maharashtra Public Commission. Out of 1151 vacancies 30% seats are reserved for the women candidates for this MPSC Engineering Services Exam. This is such a great opportunity for the Engineering Graduates of Maharashtra to become a part in prestigious water resources board. For complete details regarding Maharashtra Public Service Commission MPSC Engineering Services Exam 2019 Water Resource Board Assistant Executive Engineer AEE, Assistant Engineer AE Civil Jobs Recruitment 2019 please see the below given details. Maharashtra MPSC Recruitment 2019 Water Resources Dept. Advertisement Online Application Civil Assistant Engineer, AEE posts of 1151 vacancies. Out of 199 Assistant Engineer, AEE posts 30% posts are reserved for the female candidates and 5% posts are reserved for the sportspersons. Online application link activation Start Date 05-04-2019. Online application link deactivation Last Date 26-05-2019. Payment of fee using challan in state bank of India is Last Date 29-05-2019. For Group A Posts Pay scale Rs.15600 to 39200 + GP Rs.5400 per month. For Group B Posts Pay scale Rs.9300 to 34800 + GP Rs.4400 per month. The candidates must have qualified the Degree B.E in Civil and Water Management or Civil and Environmental or Structural Engineering or Construction Engineering / Technology from a recognized university. Age limits for this MPSC Assistant Engineer Civil Recruitment the candidates must have crossed 19 years and lesser than 38 years as on 01-08-2019. Age relaxations are applicable for SC/ST candidates as per government norms of Maharashtra. For more details please see the official notification. Selection for this Assistant Executive Engineer, Assistant Engineer and Assistant Executive Engineer jobs will be through three stages. The Fee is Rs. 373/- for general Candidates and Rs. 273/- for Reserved Candidates..
Prelims exam will be conducted for 100 marks. Candidates who called for Prelims Exam they are eligible for mains exam. Mains exam will be conducted for 400 marks. Finally interview will be conducted for 50 marks. The candidates have to apply online for this Assistant Engineer, AEE Jobs recruitment. To apply online the candidates have to login to the official website of mahapsc.mahaonline.gov.in. Before applying online must have read the official notification and user instructions. Fee to be paid through State Bank of India printed chalana at the time of online application. Click here to apply online for the Assistant Engineer, AEE Civil in Maharashtra Water Resources Board. 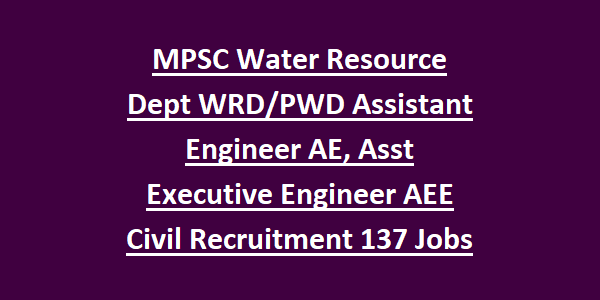 Please check here for the official notification of MPSC Water Board Civil Asst Executive Engineer, AE Jobs Recruitment. Please share this information with our beloved friends through social networking and for any queries regarding this recruitment or any other engineering jobs please feel free to comment below. 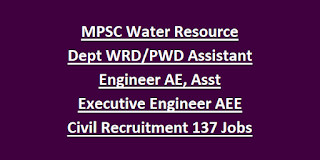 MPSC WRD Junior Engineer Civil Jobs: Maharashtra Water Resources Department WRD invites applications from the Civil Engineering Diploma qualified persons for the eligible Junior Engineer Civil jobs. There are total 15 Civil JE jobs in this Maharashtra WRD Recruitment 2018.